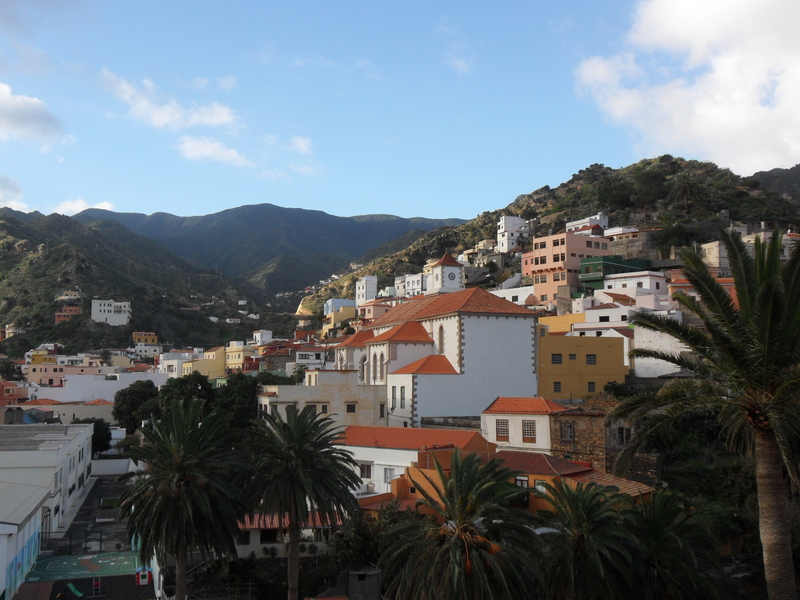 LA GOMERA – high above the sea. Blue sky was welcomed this morning for a high level circular walk on the northern coast. As often happens the path to the cemetery took us out of town and through ‘allotments’ mainly growing potatoes, marrows.and unidentified fruits. 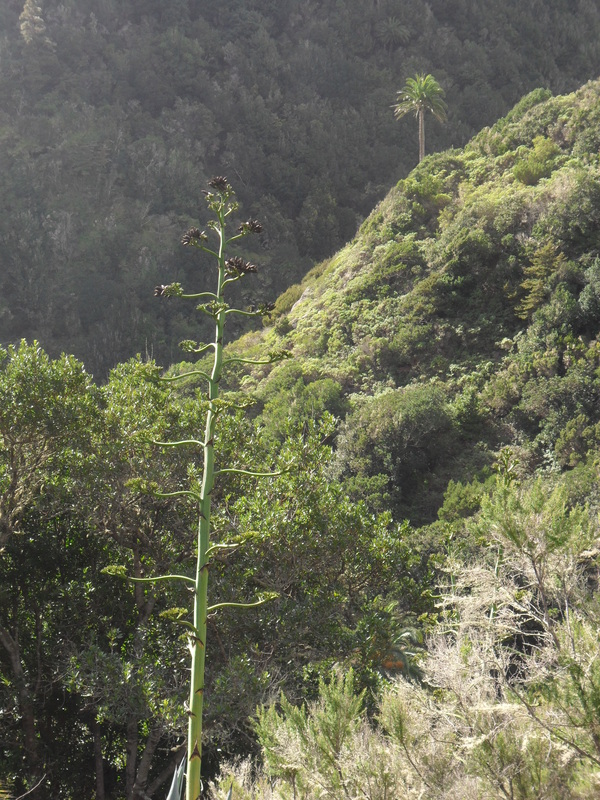 Then, in a wide hot valley, through palms, cacti, prickly pears, small drago trees, junipers and aloes. 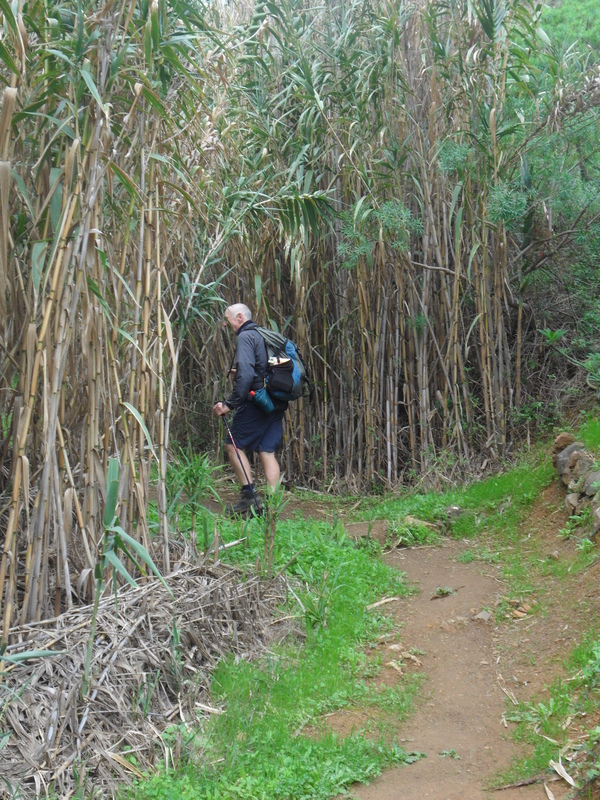 Scrambling up a river bed amongst canes. Zigzagging steeply in laurel forest to finally emerge onto a heather covered ridge. A veritable botanic journey. 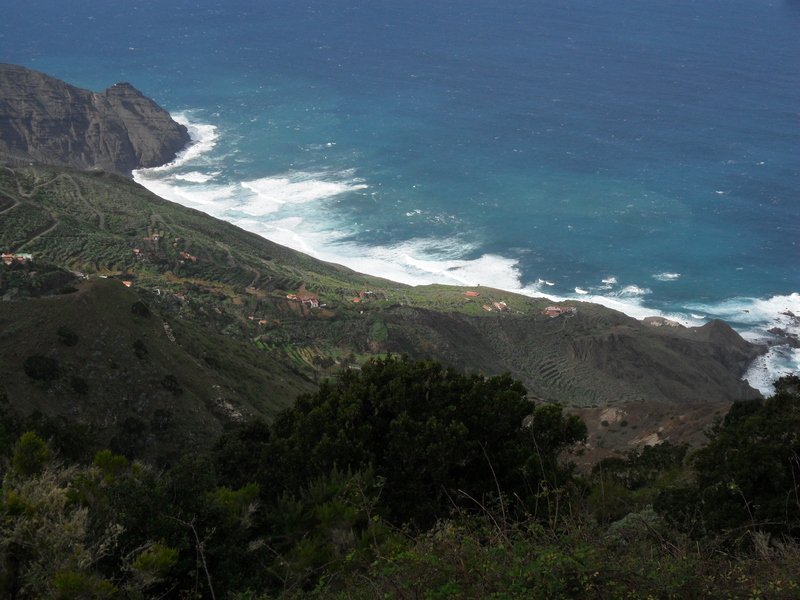 We were now high above the coast at 800m with a little hamlet, Arguamul, 300m below us. What an isolated place. Just along was a small hermitage/shrine where we ate lunch, admired the views and fed the bunch of stay cats. 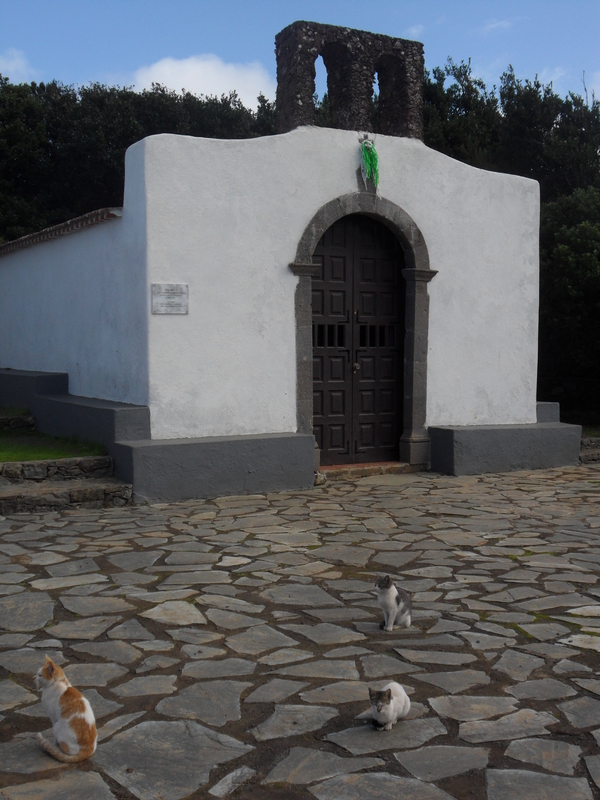 Ermita Santa Clara and cats. 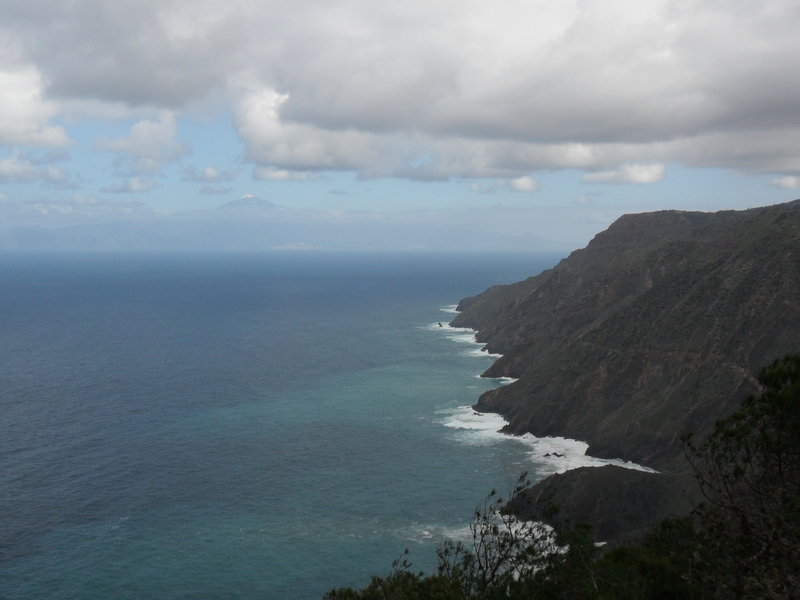 With it being clear we could see as far as La Palma another volcanic island in the Canaries group. 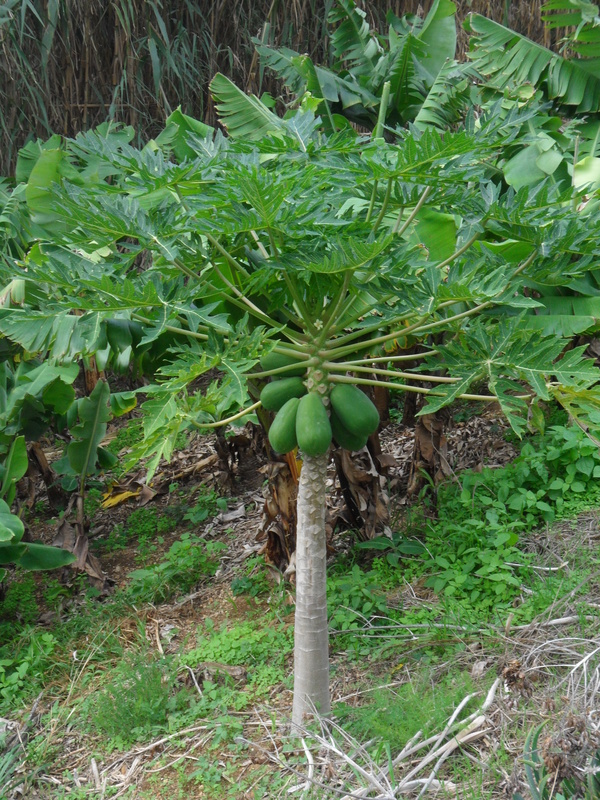 We strode out along the headland past another chapel and then the small hamlet of Chijere. Hereabouts the bare rock takes on many shades. 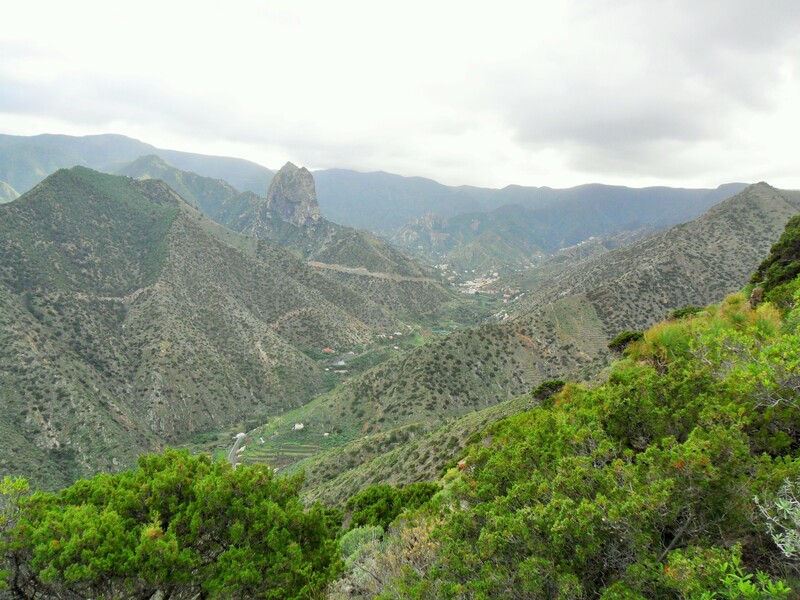 From the final viewpoint at the end we had views of the coast and Tenerife and inland to Vallehermosa and the Roque Cano. 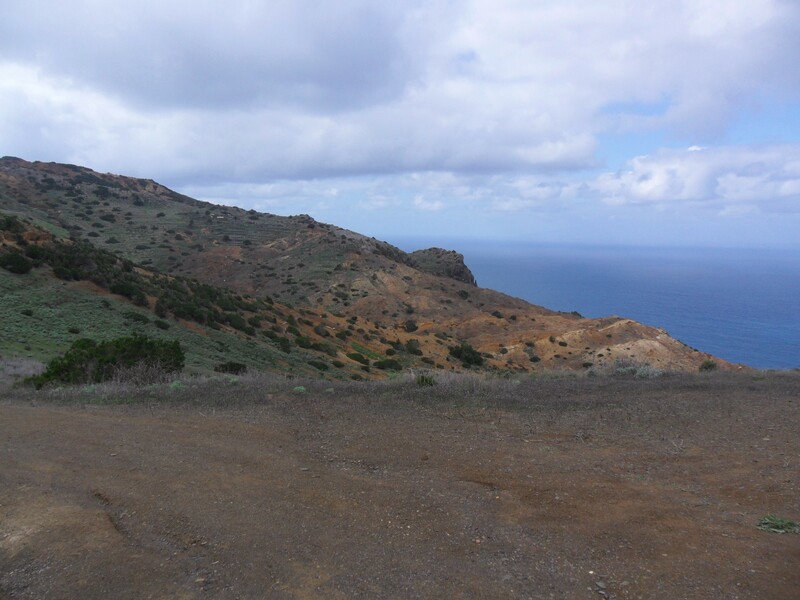 There was a steep knee-jarring descent down a ridge towards the coast. Once on the road we walked down to the little beach but the sea was too rough for a swim. We found little lanes past farmsteads under Roque Cano leading back to Vallehermosa. Roque Cano from our balcony. We never seem to get back early so before you knew it we were heading out for supper. 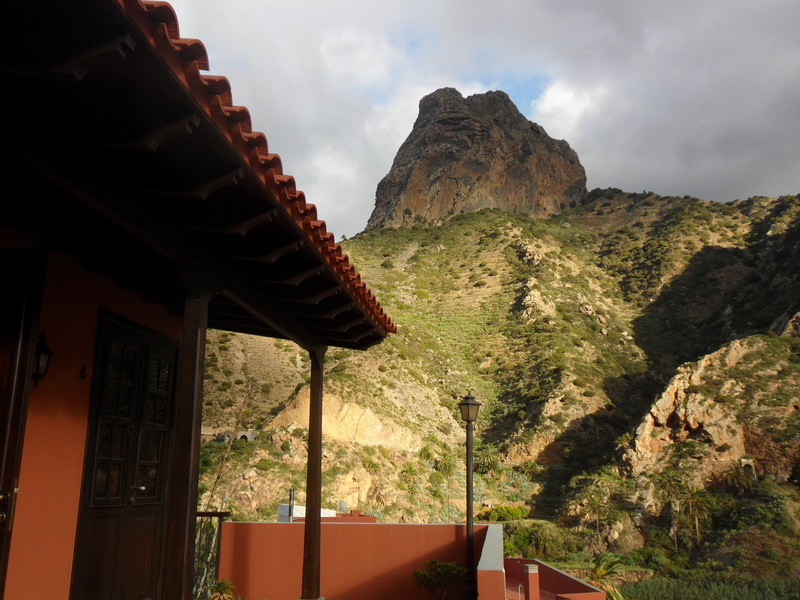 At least on La Gomera the restaurants kept sensible hours and you could eat relatively early. Catch of the day – AMBERJACK. – another tasty Atlantic fish. 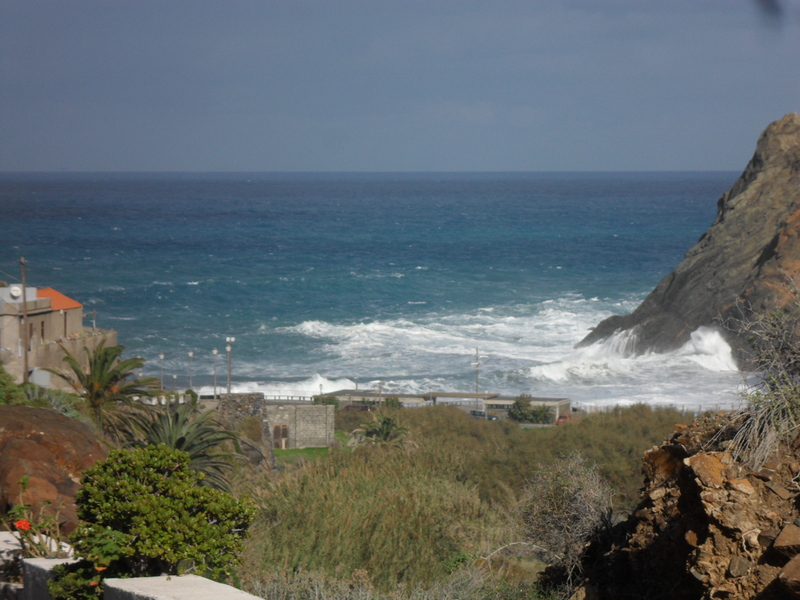 This entry was posted in Canary Islands., Walking. 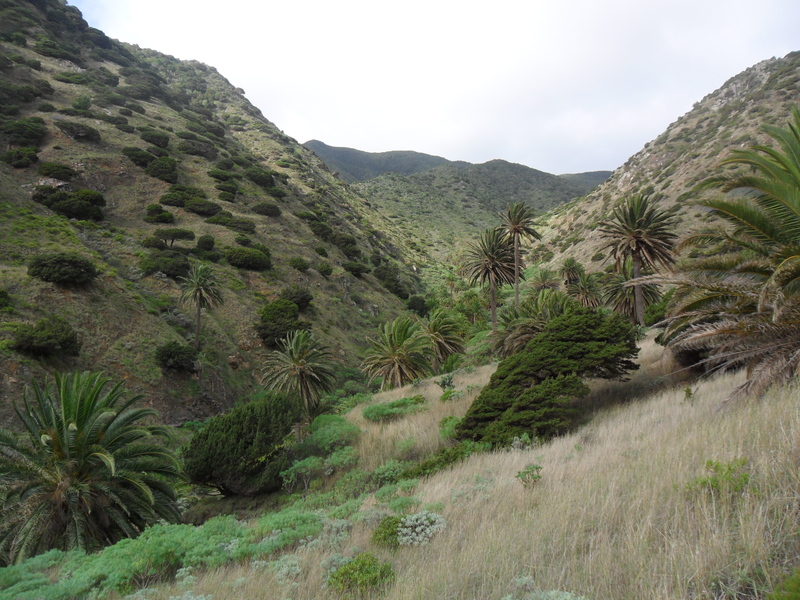 and tagged Canary Islands, La Gomera, Walking. on December 25, 2014 by bowlandclimber.